Buy Solar Decking Lights Add Style to Your Garden Patio Area with Decking Lights Powered by Solar. Easy to Fit. Best Prices, Great Reviews, Free UK Delivery. Want Solar Decking Lights that Really Work but dont cost the earth? Welcome to the PowerBee Range of Solar Powered Decking Lights at unbeatable prices !!! 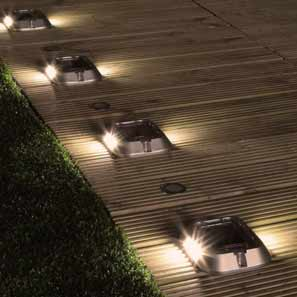 Solar Decking lights are a superb way to light your decking at night without the need for electrical wiring work. Simply install your Solar decking Lights and enjoy mains free solar deck lighting. Our solar decking lights can be used to transform your decking area, very easy to install and as usual with PowerBee Ltd we only sell the best quality, designed to work mainly in summer, but the pathfinder has great usage in winter time too.